The National Eagle Center in Wabasha is one of the many organizations losing money under the Pawlenty Administration's budget-balancing proposal. Tuesday, the governor cut $500,000 allocated towards the center's $1.5 million expansion project. Wabasha, Minn. — Tuesday morning, the National Eagle Center staff met with Wabasha officials to go over the final drafts of the center's proposed expansion. Eagle Center Operations Manager Sue Harris said they had no idea about the news that was coming. "We had to learn it from a newspaper that the funding had actually been cut," she says. "So we were kind of taken aback as you can imagine. It was like getting the wind knocked out of you. it seemed a little surreal at that point." Harris says the Pawlenty Administration told the staff the day before to prepare a proposal for the center's expansion by this Thursday. The Legislature allocated $500,000 to the National Eagle Center in 1998 as part of a capital bonding package. Since then, the Eagle Center has worked on plans to match the state's gift, including getting the city of Wabasha to contribute a $632,000 bond and land for the new center. However, the state's money sat unused for so long that Pawlenty and his commissioners zeroed in on the $500,000 allocation as part of their budget-balancing fix. Pawlenty spokesperson Leslie Kupchella says making cuts to the National Eagle Center wasn't easy, but in a year of deficit, the state must make sacrifices. "People do need to understand that we are in a budget crisis," she says. "And every single day that passes puts our state further in the red, and it really has required emergency action. As the governor said the other day, this is difficult for all of us, and we're really going to feel this pain." Wabasha has been working for a long time to capitalize on its position as a popular roosting spot for bald eagles. Built in 1996, the center is the nation's only bald eagle conservatory, and does not charge admission. 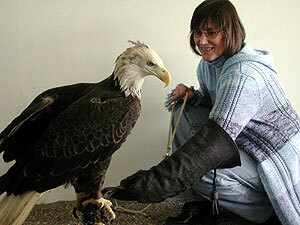 Wearing a black leather forearm glove, Harris coaxes Harriet, a seven-year-old female bald eagle, onto her arm so a volunteer can clean the bird's living area. Harriet was rendered flightless four years ago after she was hit by a car. The center's $150,000 annual operating cost comes primarily from donations and naming rights to its three ambassador eagles. These are birds the center's staff take to classrooms around the state as part of its outreach program. Last year, the center welcomed approximately 40,000 visitors from 60 countries. The proposed new center was going to be 8,000 square feet larger. The community of Wabasha raised $687,000 for the new building, the city donated $150,000, and Congress allocated $231,050 in 1999. The state funding would round out the $1.5 million construction cost. Wabasha Mayor Peter Klas says the loss of the state funding is a big setback. He'll be working hard with the center's staff to locate potential corporate donors to fill the gap. Klas says the city will also look into securing extra funding for the center from its coffers, whatever it takes to maintain this project. According to Klas, the Eagle Center, once built, will have the kind of economic impact on Wabasha as the construction of the interstate bridge did in the 1920s. "We're going to be very careful where we spend the money on any kind of project," he says. "But this Eagle Center thing, it's been in the works so long and we've devoted so much time to it that we'll do the very best to complete the project." Back at the National Eagle Center, Sue Harris and a visitor look through a telescope on the center's viewing deck. Two hundred yards away, four bald eagles are devouring a fish on an icefloe in the Mississippi River. Harris says she hopes more visitors can enjoy this scene in the years to come, but the most recent cut has her worried. "We don't have WalMarts," she says. "We don't have Targets. We don't have science museums. We have the Anderson House and we have Eaglewatch. Eagle's have basically put Wabasha on the map." Sue Harris and her staff hope that Wabasha will stay on the map. The National Eagle Center still plans to go ahead with its expansion. But they admit they don't know when the work will be completed.